At this point, most major car companies have taken steps towards greening their vehicles with hybrid and all-electric engines. But if the cars are being sold in energy-guzzling dealerships, well, that just looks bad. That’s part of the reason why Ford recently launched a voluntary dealer sustainability program to help dealers become more energy-efficient. 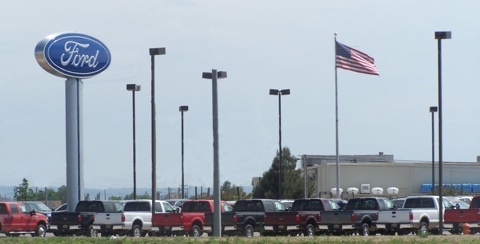 The program, developed in a partnership with the Rocky Mountain Institute, offers dealers the opportunity to receive comprehensive energy assessments from sustainability experts at Ford. “We’ll give an on-site overall analysis and offer dealers a menu of things they can select,” explained Sue Cischke, Ford’s group vice president of sustainability, environment, and safety engineering. Dealerships will have to pay for the upgrades themselves, but Ford will help navigate state and federal tax incentives as well as product selection. Before officially rolling out the program, Ford is piloting it at three dealerships in Florida, New York, and Nevada–locations chosen for their varied climates. Once the program goes nationwide, Cischke expects that it will give participating dealerships a leg up on their competitors. “It’s a way to show the community that they’re interested in going green,” she said. And since U.S. car and light truck sales dropped 21% in 2009, every little bit helps.